Our total facility consists of 75,000 sq. 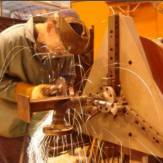 feet, with a Welding and Fabricating Dept., Blasting, Painting and Assembly areas. 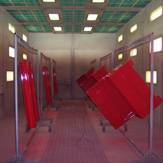 We have a state of the art down draft painting facility with curing capabilities to 200 degrees and an in-line paint mixing system. Our blasting capabilities consist of a 15' x 25' booth and cabinet blaster for smaller parts. We have five hoists in our welding area with 10,000 lb. capacity each and 14' under hook. Our counterweight filling area has a 30,000 lb. hoist with 15' under hook and a digital 50 ton scale for filling counterweights. The assembly area has an inventory of components required to complete various projects such as operators compartments, fuel and hydraulic tanks. There is also provisions for glass installation and decal application to finish your assembly. Our programming department has the capability to import most cad drawings and image formats which can be sent email or any digital media. We have KeyCreator 3D modeling engineering software and Merry Mechanization Programming software to take your cad drawings virtually to our machines directly. We carry a extensive inventory of steel, stainless and aluminum sheets and plates in many sizes and in thicknesses from 30 ga. thru 3.00". 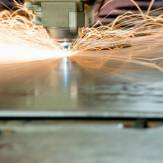 This includes various grades of steel from hot and cold rolled to grade 80 and T-1 plus others. 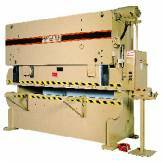 We also carry many sizes of bar, channel and angle iron along with deck and catwalk grating. 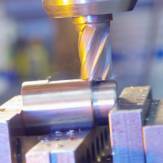 Machining is a series of processes in which various tools, saws, grinders, drill presses, milling machines are used with a sharp cutting tool to mechanically cut the material, (steel, aluminum, plastics, wood, other metals) to achieve the desired shape. 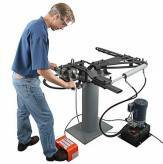 A drill press is often called a pedestal drill, pillar drill, or bench drill, is a fixed style of drill that is mounted on a stand or bolted to the floor. A drill press consists of a base, a column, a table, a spindle , and drill head, that is driven by an induction motor. The head has a set of handles (usually 3) radiating from a central hub that, when turned, move the spindle and chuck vertically, parallel to the axis of the column. 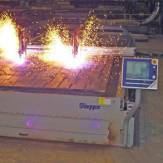 Welding is a fabrication process that joins materials together. This is done by melting the workpieces together and adding a filler material to form a pool of molten material that cools to become a strong joint, with pressure sometimes used in conjunction with heat, or by itself, to produce the weld. 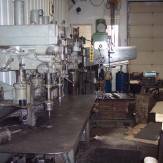 Tube bending is a metal forming processes used to permanently form pipes or tubing. 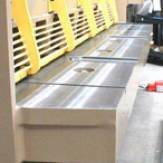 There are several bending procedures that can be used and depending on our customers specific needs. 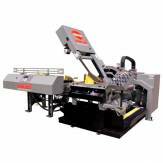 Most commonly round stock is used in tube bending. However we can also bend square and rectangular tubes and pipes to meet job specifications.